Alpine Public Library is proud to present Alpine’s first ever Dancing with Alpine’s Stars, a dancing competition fundraiser. Join us for an evening of lively entertainment as ten couples competitively dance their way to the top! Vote for your favorite team of dancers. Votes are $5 each and you may vote as many times as you like (it’s a fundraiser!). Dancers will compete for two trophies. One trophy will be awarded to the couple that receives the most votes overall. The second trophy will be awarded to the couple that receives the most votes on the night of the event. Use the buttons below to pay for dancer votes through PayPal. Each couple will also will be selling votes to be counted before the event. Voting on the night of the event will most likely be cash only. This exciting event will be held at the Alpine Civic Center on Saturday, February 16, from 7:00 PM to 9:30 PM. Cost of entry to this event is $20 for a single attendee and $35 for couples. Ticket price includes heavy hors d’oeuvres and one drink per spectator, beer or wine. Water will also be available. 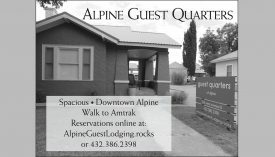 The proceeds from this fundraiser will go to the Alpine Public Library. We’ll see you on the dance floor!